As His Holiness Pope Francis visits Bethlehem on pilgrimage as part of his first official visit to the Holy Land on Sunday, Ma'an will be carrying a live feed all day. 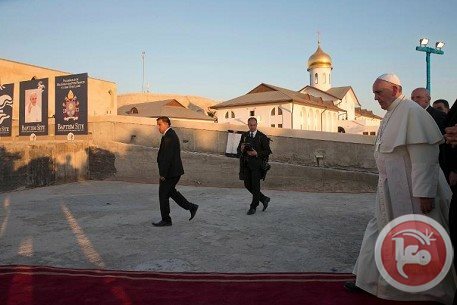 The Pope will give an open-air mass in Bethlehem's historic Manger Square this morning before preceding to meet with a number of local families as well as children from Duheisha refugee camp near Bethlehem. 16:07 The Pope has left Duheisha and arrived at the Bethlehem helipad, and is currently preparing to board the official helicopter. 15:54 The delegation of children from Duheisha refugee camp presented Pope Francis with two gifts on behalf of the refugee children of Palestine during his visit to the camp. The children gave Pope Francis a large refugee card in the style of those given out by the UN's refugee agency UNRWA in the name of Jesus Christ, who the children referred to as "the first refugee." The children also presented His Holiness with a key, symbolizing the desire to return of 750,000 Palestinian refugees and their descendants who were expelled from what became Israel in 1948 and were never allowed to go back to their homes. 15:43 Pope Francis is now meeting with children in Duheisha refugee camp, and the children are presenting a number of their wishes and hopes for basic freedoms for Palestinians. Pope Francis is addressing the crowd in Spanish with an Arabic translator, and the children are welcoming him and expressing their hopes for peace in the land and support in the struggle of Palestinians to achieve their "basic rights" despite living "in the shadow of occupation." The children also express their solidarity with the more than 100 hunger-striking Palestinian prisoners in Israeli prisons protesting their detention without charge or trial, as well as solidarity with Palestinian refugees in Syria's besieged Yarmouk camp. As the Pope is speaking, children are raising posters with various statements written upon them, including "Muslims and Christians live under occupation" and "We demand the freedom of worship." 15:30 Pope Francis has now left Manger Square en route to Duheisha refugee camp, where he will meet with children from Bethlehem's largest refugee camp, before continuing on to Jerusalem. Duheisha refugee camp is one of three camps in Bethlehem housing more than 20,000 Palestinian refugees whose families were expelled or fled from their homes in what is today Israel in 1948. Israel has never allowed them to fulfill the right to return to their homes, similar to around nine million Palestinians worldwide. 15:06 Palestinian officials have reportedly accepted a papal invitation to attend a Vatican meeting with an Israeli delegation, CNN reported minutes ago. CNN quoted an unnamed PLO executive committee member as saying that the Palestinians were willing to take up an offer made by the Pope earlier today during his visit to Bethlehem. 14:34 We now have a full translation up of President Abbas' remarks during a press conference earlier this morning welcoming Pope Francis on his first official visit to the Holy Land. We count on Your Holiness to contribute towards enabling our people to attain their freedom and full independence, by bringing the Israeli occupation to a complete end and establishing an independent state with East Jerusalem as its capital. 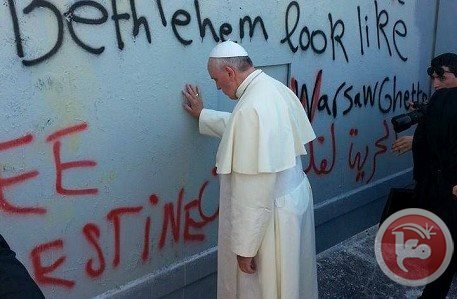 Your Holiness, you saw the monstrous wall being constructed by Israel, the occupying power on our land, at a time when we desperately needed to build bridges of communication and dialogue rather than anything that would sow the seeds of hatred, malice, and hostility. We, the people, are looking to live in freedom and dignity and to have sovereignty over our national soil, away from the occupation. We have fully updated His Holiness on the outcome of the peace process and the pitfalls and obstacles which befell it, primarily the settlement enterprise, and daily attacks on places of worship including churches and mosques, as well as the continued detention of thousands of Palestinian prisoners in Israeli jails , who yearn for freedom. A number of these prisoners have been on hunger strike for more than 30 days in protest against ill-treatment and detention without trial or verdict, under the pretext of "administrative detention." Abbas' mention of the ongoing hunger strike of more than 100 Palestinian prisoners will certainly give hope to them and their families, especially as 100 more prisoners from Israel's Nafha prison have joined the strike in solidarity in the last two days. 14:20 Pope Francis is currently meeting with Christian Palestinian families at a restaurant in Manger Square before continuing on to Duheisha refugee camp, from where he plans to continue to Jerusalem. 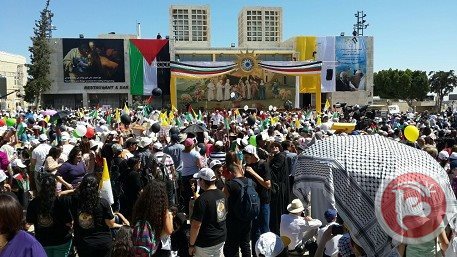 A Palestinian Liberation Organization source estimated that around 9,000 worshipers -- both local and foreign pilgrims -- turned out for the mass, while hundreds if not thousands more lined the roads between the presidential palace and the square to greet him. Palestinian Christians traveled to Bethlehem from across the region to meet the pope, including 650 from Gaza who were given permits given permits by Israel to travel to the West Bank. Only those above the age of 35 were allowed to travel. Although around 1,500 Palestinian Christians live in Gaza and around 50,000 live in the West Bank, Israel has severely restricted the ability of Palestinians to move between the West Bank and the Gaza Strip since the imposition of a siege on Gaza in 2007. Many also came to see the Pope from inside Israel, where around 130,000 Palestinian Christians with Israeli citizenship -- the descendants of Palestinians who managed to stay on the land despite the 1948 campaign of expulsion against Palestinians -- still live. 13:32 During Pope Francis' stop to pray at the separation wall earlier today, a group of children from nearby Aida refugee camp approached him in order to deliver a letter. Aida refugee camp is one of three camps in Bethlehem housing more than 20,000 Palestinian refugees whose families were expelled or fled from their homes in what is today Israel in 1948. Israel has never allowed them the fulfill the right to return to their homes, similar to around nine million Palestinians worldwide. Pope Francis plans to meet with a number of children from the camps at the Duheisha refugee camp, Bethlehem's largest with almost 15,000 residents, later Sunday. The contents of the letter delivered to the Pope are still unknown, but we have received a number of photos documenting the moment when a girl approached him. 13:19 Israeli police have arrested 26 Jewish extremists who were "throwing stones and bottles" at a site in Mount Zion in Jerusalem that the Pope is expected to visit tomorrow. Two police officers were injured in the clashes. The clashes come after 15 Jewish radicals were put under house arrest in recent days in order to prevent disturbances prior to His Holiness' visit, and amid a wave of anti-Christian and anti-Arab attacks within Israel in recent months. 13:06 His Holiness Pope Francis has concluded open-air mass with just more than 9,000 worshipers in Bethlehem's Manger Square. He is now headed to have lunch with five Palestinian Christian families from across the West Bank and Gaza at Casanova restaurant in the square. 12:40 For those just joining us, Pope Francis has arrived via helicopter in Bethlehem from Jordan, where he began his first official visit to the Holy Land. 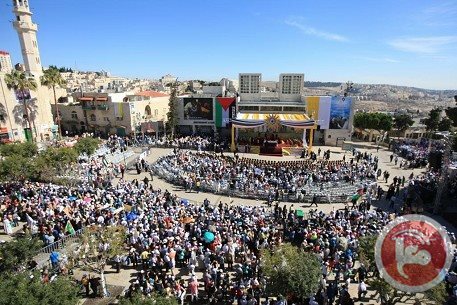 After a press conference beside president Mahmoud Abbas, His Holiness toured Bethlehem earlier Sunday and is currently giving an open-air mass in the city's historic Manger Square. Following the service, the pope will have lunch with a number of Palestinian Christian families, who will share their concerns and experiences under occupation. He will then meet with a number of children in Bethlehem's Duheisha refugee camp, home to nearly 15,000 Palestinians whose families were expelled from what became Israel in 1948, and have never been allowed to return. Check out our live feed for full coverage. Below are some images of the open-air mass in Manger Square currently underway. The Church of the Nativity, where Jesus is believed to have been born, is visible to the right, while the Bethlehem Peace Center is directly behind the stage. The Mosque of Omar is just out of the frame to the left. The mosque is the oldest in Bethlehem and is a symbol of coexistence, as it was built on land given by the Greek Orthodox Church to Bethlehem's Muslims community on the site where the Islamic caliph Omar ibn Khattab is believed to have issued a law guaranteeing respect for Christians and clergy in the Holy Land after conquering Palestine. 12:25 A number of organizations representing the Christian Palestinian community of occupied East Jerusalem have released a letter directed to Eastern Orthodox Patriarch Bartholomew I on the occasion of his visit to meet with Pope Francis. The letter, entitled "Our presence in Jerusalem is a legacy since the resurrection," welcomes the leader but expresses "dismay" at the church's failure to adopt a clear policy to defend the Christian Palestinian population of the holy city. The groups highlights the massive decline in the population from 24,000 to 9,000 since Israeli occupation began in 1967, blaming the "displacement, house confiscation and demolitions, revocation and denial of residency rights and restrictions of movement." We long to live normal lives in our city with full human rights and total freedom. Not with barriers and bars. We long for a living church, not empty stones. We aspire to self-determination, liberated from an oppressive occupation that imposes discriminatory regulations and laws where Jerusalem becomes exclusive for one people and one religion. At a time when our mere existence in our city is threatened, we expect a different approach from our religious leadership to emphasize the Christian presence and existence in the Holy Land. We expect Your holiness to make gestures to your constituency that you care for, your constituency that remained faithful to Lord Jesus in his city Jerusalem as the first Christian congregation, and who welcomes you today in love and aspiration. Unfortunately, Your holiness's program in Jerusalem does not provide any consideration towards the Palestinian Christians' aspirations nor their national leadership to send out a moral voice against Israeli policy of annexation and ethnic cleansing of all non-Jews in Jerusalem. As per International Law, East Jerusalem including all of the Old City is Palestinian. 12:01 Ahead of Pope Francis' visit, Israeli authorities have placed at least 15 suspected Jewish extremists under house arrest in order to ensure they do not disrupt the trip. The move follows protests in recent weeks against his visit by ultra-Orthodox groups, as well as a wave of anti-Christian and anti-Arab "price-tag" hate crimes directed against church property and Christian holy sites across Israel. Security in Jerusalem is especially high today ahead of his visit tomorrow, with large swathes of the historic Old City being closed off. 11:36 Pope Francis is currently addressing the crowd at an open-air mass in Bethlehem's historic Manger Square. Check our live feed for full coverage. 11:34 As we reported earlier, while en route to Manger Square to deliver an open-air mass, His Holiness Pope Francis exited his vehicle and stopped by the Israeli Separation Wall as it passes through northern Bethlehem. While there, he knelt down and prayed at the wall in the direction of Jerusalem, which is cut off from Bethlehem by the wall and the Israeli checkpoints. 11:28 The full text of Pope Francis' remarks earlier today at the presidential palace in Bethlehem are now available here. In his address, he told President Abbas: "You are known as a man of peace and a peacemaker. Our recent meeting in the Vatican and my presence today in Palestine attest to the good relations existing between the Holy See and the State of Palestine." 11:09 Prior to arriving in Manger Square a few minutes ago, Pope Francis stepped out of his car and walked to the Israeli separation wall as it cuts through northern Bethlehem. 11:06 President Mahmoud Abbas has now arrived in Manger Square, ahead of an open-air mass the pope is expected to deliver. 11:04 Pope Francis passed along the Hebron-Jerusalem road earlier before turning onto Nativity Street en route to Manger Square. 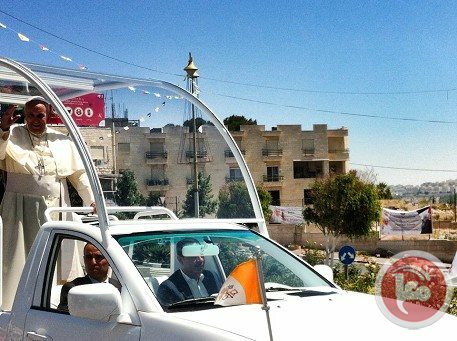 He passed through the entire city on his pope-mobile, foregoing the usual bulletproof glass to be closer to worshipers. He is now greeting crowds and shaking hands in Manger Square. 10:52 Pope Francis has just arrived in Manger Square, where he is being greeted by around 9,000 worshipers ahead of an open-air mass he is expected to give in front of the Nativity Church. 10:26 A number of Palestinian Christian families from both the West Bank and the Gaza Strip will meet with the pope over lunch today in Bethlehem. The families plan to share their concerns and issues with His Holiness, stressing the effects of the Israeli occupation, land confiscation, and the blockade of Gaza on their lives and livelihoods. Read our report on each of the families and their experiences here. Juliet Abu Muhr of Beit Jala is a member of one of the families that will meet with the pope. The Abu Muhr family owns land near the Cremisan Monastery that is slated for confiscation by Israeli authorities. Part of it has already been taken to build a bypass road for Israeli settlers through the area. "This land means the future of ourselves and our children. Our story is one of tens of thousands of stories of Palestinians who have been suffering from the separation wall and the settlements," Juliet Abu Muhr told Ma'an Saturday, in a message she plans to deliver to the pope as well. 10:18 Pope Francis and president Mahmoud Abbas are currently speaking at a joint press conference in Bethlehem. Check our live feed for full coverage. 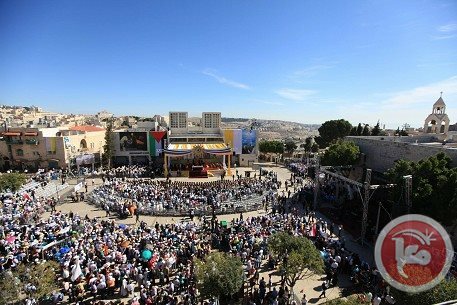 10:03 A PLO source estimates that there are currently 9,000 worshipers gathered in Manger Square to greet the pope ahead of an open-air mass he is expected to hold there later this morning. The square is currently overflowing, and the alleyways leading away from the square are full of both locals and pilgrims eagerly awaiting His Holiness. 9:43 Abbas now welcoming pope at the presidential headquarters in Bethlehem. 9:38 In advance of the pope's visit today, the streets of Bethlehem have been lined with banners to welcome him. Residents and local shopkeepers have put up personalized banners welcoming him on behalf of individual families, while officials have also covered the roads with posters. 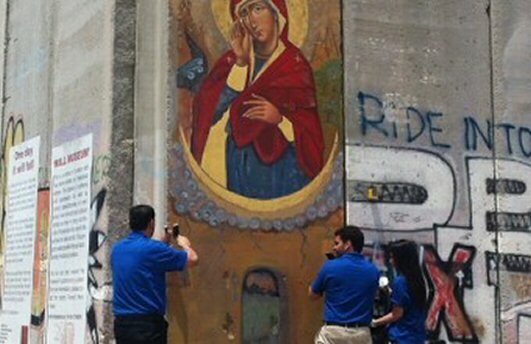 Read more about the project in our report from yesterday, "Bethlehem walls transformed in the presence of the Holy See.". 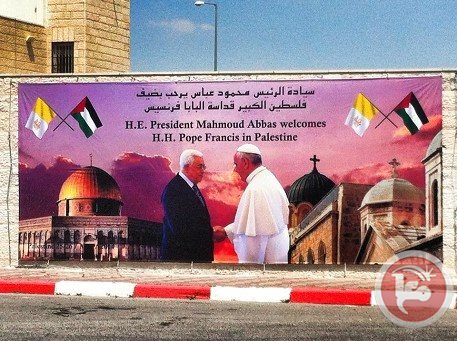 9:24 Ma'an editor-in chief Nasser Lahham says that the pope's visit to Bethlehem is a "confirmation that he recognizes the Palestinian state." In 2012, Pope Francis officially endorsed a UN General Assembly resolution that recognized the State of Palestine as an official non-member state. We also have some images of His Holiness' arrival via helicopter from Jordan from just a few minutes ago. 9:15 The Pope has disembarked from his helicopter and is currently walking with president Mahmoud Abbas on the landing pad, before continuing on to Manger Square to preside over an open-air mass with tens of thousands of worshipers. 9:10 Thousands of worshipers are currently gathered in Bethlehem's historic Manger Square awaiting His Holiness ahead of an open-air mass he is expected to hold there in front of the Nativity Church. The roads leading to the square from the helipad throughout Bethlehem are currently lined with pilgrims and locals eagerly expecting the Pope with a mix of Vatican, Palestinian, and Argentine flags. 8:55 Pope Francis has arrived via helicopter from Jordan in Bethlehem, and just touched down at the helicopter pad near Duheisha refugee camp, where he was met by church and Palestinian officials. 8:50 Papal helicopter flies over Manger Square as thousands await His Holiness below. 8:45 Catholic Pope Francis continues his pilgrimage to the Holy Land today as he arrives in Bethlehem, after spending the day before in Jordan. Yesterday he gave a mass in Amman and met with Syrian refugees, before heading to the Jordan river. Today he is expected at the Church of the Nativity this morning and will meet with Palestinian refugees at Duheisha refugee camp later in the day. Jerusalem police arrested 26 Jewish extremists protesting Sunday at a holy site on Mount Zion outside the Old City that will be visited by Pope Francis, a spokesman said. The arrests took place just hours before Francis' arrival in Jerusalem. "Demonstrators at King David's Tomb threw stones and bottles at the security forces, lightly injuring two police," spokesman Micky Rosenfeld said, referring to a site revered as holy by Christians, Jews, and Muslims where the pope will celebrate mass on Monday. 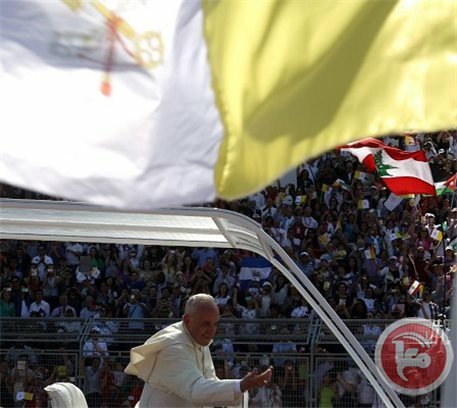 Israeli public radio said 150 extremists had gathered to denounce the pope's upcoming visit and were chanting slogans against the atrocities committed by the church against Jews during the Crusades and the Inquisition. The upper floor of the building where the tomb is located is known to Christians as the Cenacle, the place where Jesus ate the Last Supper and where his followers were baptized by the Holy Spirit at Pentecost. Under Israeli law, Christians are only permitted to pray there twice a year, and plans for the pope to celebrate mass there have prompted weeks of protest and several incidents of anti-Christian vandalism. The following is the official translation of the full text of Pope Francis' speech at the Palestinian president palace beside Mahmoud Abbas Sunday morning. Mr President, dear friends gathered here in Bethlehem: may Almighty God bless you, protect you and grant you the wisdom and strength needed to continue courageously along the path to peace, so that swords will be turned into ploughshares and this land will once more flourish in prosperity and concord. Salaam! Among the many people planning to meet with Pope Francis during his Sunday visit to Bethlehem are a number of families, chosen by a special committee to give His Holiness a sense of the diversity of Palestinians' experiences. The families represent a wide variety of the concerns and issues facing Palestinian Christians today, including the occupation, land confiscation, and the siege on Gaza. Among the families who have been selected to meet His Holiness is the Abu Muhr family from Beit Jala. The family owns 17 dunums (4 acres) near Cremisan Monastery in Beit Jala west of Bethlehem that are slated for confiscation by the Israeli occupation. Part of their land has already been been taken over to construct a road for the exclusive use of Jewish settlers. "This land means the future of ourselves and our children. Our story is one of tens of thousands of stories of Palestinians who have been suffering from the separation wall and the settlements," Juliet Abu Muhr told Ma'an. "We will deliver a message to His Holiness in his mother tongue Spanish, as my husband speaks the language," she added, in reference to her husband Ilias. Another family who will meet the pope represents Bethlehem families whose children were deported from Bethlehem by Israeli occupation authorities following their siege of the Church of the Nativity in 2002 during the Second Intifada. "We are happy that my mother will have the opportunity to sit with His Holiness the pope at the lunch table and deliver a message on behalf of the deportees," says Nasser Shatara, whose brother Raed was deported from Bethlehem to the Gaza Strip in 2002. "My brother Raed," he added, "was deported 13 years ago and my father died after the deportation," he added, explaining that the family has been suffering like many other families because of Israeli occupation. "We hope His Holiness will help us." Shatara's mother Layla said as she burst into tears: "I want to ask the pope to bring back my son because I miss him and I am sure all mothers of deportees and prisoners feel the same." Following the Israeli siege of the church, a deal was reached with the dozens of Palestinian militants who had sought refuge inside to deport them to the Gaza Strip, Spain, and Italy. Many of the individuals were denied the chance to see their families before being deported. Rania Michael Misamek, a Christian woman who lives in Gaza City, will also meet the pope in Bethlehem. "It is an honor to represent my city, Gaza, and the whole Gaza Strip, at the lunch table with the pope and to talk about the suffering of the Gazan people as a result of the siege and the injustices (we suffer), as most Christian young people in the strip are unemployed. This will be my message to the pope." Fadi Halabi from Jerusalem will also meet the pontiff in Bethlehem representing Palestinian prisoners in Israeli custody. Halabi himself is a former prisoner who served several years, similar to the 20 percent of the entire Palestinian population that spent some time in Israeli jails since 1967. "I will deliver to his holiness a message about Palestinian prisoners in Israeli custody and how their families suffer during family visits to occupation jails." Mayk Abed Rabbo, meanwhile, from Beit Jala will tell a different story to Pope Francis. "I don't have any documents to prove who I am. I don't have a birth certificate, neither do I have an identity card and thus I couldn't finish my education. I couldn't even get a driving license or do anything in my life. In effect I am not present in this world and that will be my message to the pope and I hope he will help me and all others who have been suffering." Father Ibrahim Faltas, economist for the Custody of Holy Land, told Ma'an that he was happy with the families selected to meet with the pope as they represent different sectors of the Palestinian society and can represent very well the people's concerns and issues. Speaking to Ma'an on Saturday, he said that families will meet the pope over lunch. In addition, a group of civil society organizations will also meet the pope, added Faltas. Pope Francis arrives in Bethlehem Sunday to begin the most sensitive part of his three-day Middle East tour aimed at forging regional peace and easing an age-old rift within Christianity. After beginning his trip in Jordan on Saturday with an urgent appeal to end the bloodshed in Syria, the head of the world's 1.2 billion Catholics was to take his "pilgrimage of prayer" to Israel and the Palestinian territories. Although Francis himself has said it will be a "purely religious trip," both Israel and the Palestinians will be looking to use the visit to score a few political points. The Vatican said the main reason for the visit was a meeting in Jerusalem with Bartholomew I, the Orthodox Patriarch of Constantinople, and "to pray for peace in that land, which has suffered so much." 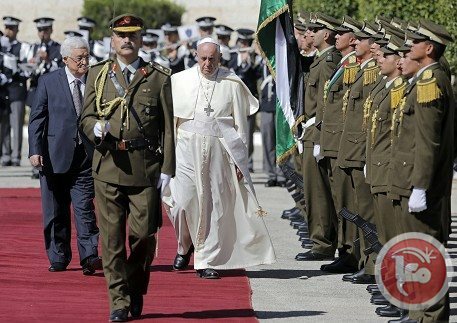 But ahead of the trip, the Vatican's Secretary of State Cardinal Pietro Parolin defended the Palestinians' right to a "sovereign and independent" homeland and said he hoped Francis's visit would lead to "courageous decisions" for peace. 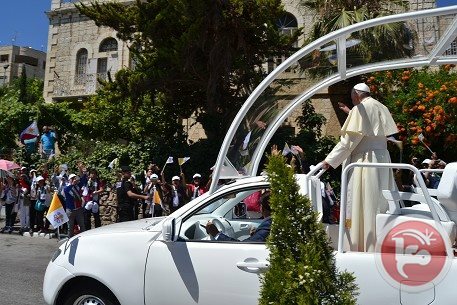 The crowd-loving pope will drive through Bethlehem in an open-top car, raising security concerns in a region racked by political and religious strife. In Israel, police issued restraining orders against 15 right-wing Jewish activists, barring them from sites that the pope will visit following a string of anti-Christian hate attacks. Police with sniffer dogs on Saturday combed the narrow streets of Jerusalem's Old City, closely examining all the shops along the stone alleyways down which the pontiff will walk later on Sunday. Although the Vatican has said the emphasis of the pope's visit is to heal a centuries-old rift between the Catholic and Orthodox worlds, every gesture he makes is likely to come under close scrutiny by both sides. John Allen, an expert on the Vatican at the Boston Globe said the pope was likely to "charm" both sides. "Jews like him, Muslims like him," he told AFP. "Francis comes in with a lot of political capital. He's sort of a new Nelson Mandela, a new moral authority on the world stage. "The question is: can he spend that moral capital to shame both sides into talking to each other? You might be able to get a public commitment to resume dialogue. It's the most we can expect." US-led peace talks between Israeli and Palestinian negotiators collapsed amid bitter recriminations last month, ending a nine-month bid to reach a negotiated solution, with no political initiative on the horizon. Travelling with the Argentine pontiff are two of his old friends from Buenos Aires -- Rabbi Abraham Skorka and Islamic studies professor Omar Abboud -- in a symbolic gesture of openness. 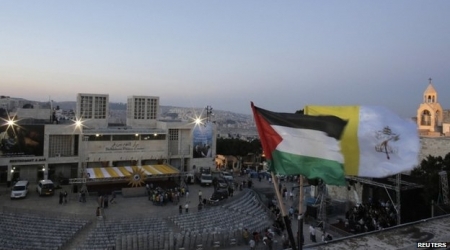 In Bethlehem, the West Bank town where Jesus was born, the pontiff will meet Palestinian president Mahmud Abbas and celebrate an open-air mass with nearly 10,000 worshipers in Manger Square. Afterwards, he will have lunch with several Palestinian families then meet children from three nearby refugee camps. During the afternoon, he will take a short flight to Tel Aviv where he will be formally welcomed to Israel by President Shimon Peres before flying on to Jerusalem. "I don't think the visit is going to bring the signing of a peace deal tomorrow... but I am sure that it will make a substantial contribution, because the pope respects all cultures and all religions," Peres told French daily Le Figaro. It is inside Jerusalem's walled Old City that he will attend a special joint service with Bartholomew in the Church of the Holy Sepulchre -- venerated as the place of Jesus' crucifixion and resurrection -- which is seen by the Vatican as the highlight of the visit. 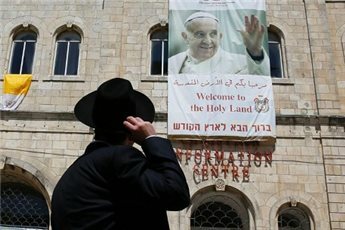 Monday will see Francis meeting Jewish and Muslim leaders at two key holy sites in the Old City, as well as holding talks with Prime Minister Benjamin Netanyahu which will touch on politics. The official spokesman of the Global March to Jerusalem (GMJ), Zaher Birawi, has expressed dismay at Pope Francis’s planned visit to the Buraq Wall named by the Israel occupiers as the “Wailing Wall” in occupied Jerusalem. Birawi said, in a press release on Sunday, that the visit would send a negative message to the Muslims, who believe that the Buraq Wall (western wall of the Aqsa Mosque) is an inseparable part of the Aqsa Mosque, which, in its turn, is part and parcel of their creed. The GMJ spokesman also denounced the Pope’s scheduled visit to the tomb of Theodor Herzl, the founder of Zionism who contributed in the displacement of tens of thousands of Palestinians out of their ancestral land. Birawi hoped that the Pope would keep aloof from such acts that would smear the religious features of his visit to the Holy Land. Meanwhile, the GMJ international committee condemned, in a separate statement, the escalating attacks on Palestinian Christians in Jerusalem, which witnessed a remarkable increase few days before the visit of Pope Francis to Jerusalem on Sunday. Israeli authorities have allowed 660 Christians from Gaza to see Pope Francis, on Sunday, in the occupied West Bank city of Bethlehem. According to Al Ray, the Ministry of Interior has reported that dozens of Christians left Gaza on Friday, via Erez crossing, in the northern Gaza Strip, saying that new waves are to leave Gaza in few days for the same purpose. Permits are valid for one week only and to be distributed to Christians of over 35 years of age only. Gaza is home to only some 1,500 Christians out of an overwhelmingly Muslim population of 1.8 million people, Al Ray reports. Most of these Christians are Greek Orthodox, with only about 130 devoted to Roman Catholicism. In related news, a Palestinian clerk has urged officials to inform the Pope about Israel’s illegal violations against the hunger-striking Palestinian detainees in Israeli prisons who are currently engaged in a massive protest against the so-called "Administrative Detention", in which Palestinian prisoners are held under harsh conditions without charge or trial, and under ‘secret evidence’ that is never revealed to the prisoner nor their lawyer, and may or may not even exist. 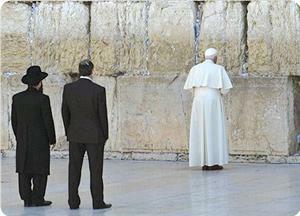 Pope Francis is expected to pray at the Western Wall, on Monday, and will be laying a wreath at the grave of Theodor Herzl, the internationally recognized founding father of Zionism. Workers from an Israeli construction company were stopped by protesters, on Friday, as they were painting a section of the massive so-called "separation barrier" which is to extend approximately 430 miles througout the West Bank region upon completion. 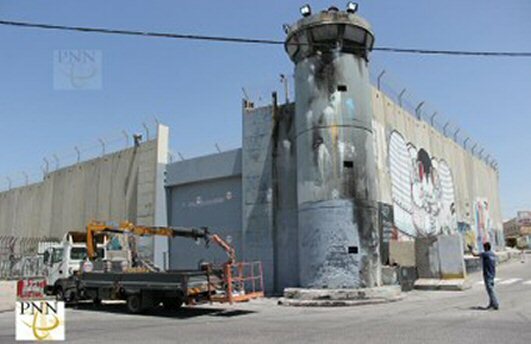 The workers were painting, in white, over a part of the wall and gate located in the main entrance of the West Bank city of Bethlehem, according to the PNN, in order to improve its appearance for the visit of Pope Francis. 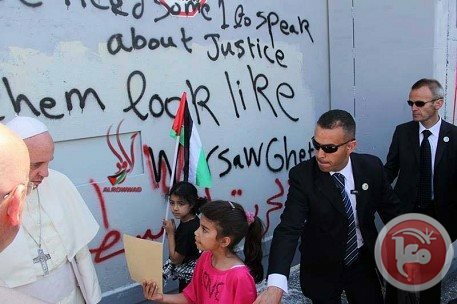 The activists asked the construction workers to stop painting because of the fake message that Israelis wish to present to the world during Francis' visit to Bethlehem, as the West Bank continues to be under siege by the wall, blocked by military checkpoints and subjected to suffering over ongoing land confiscations. 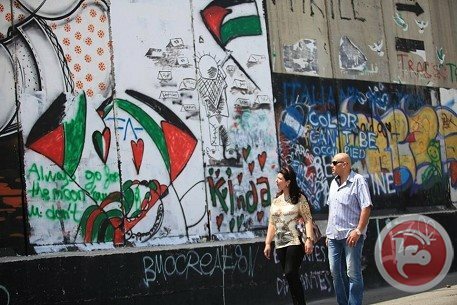 The activists concluded, PNN further states, by saying that Muslim and Christian residents of Bethlehem will send messages to the Pope in different ways, in order to show him and the world the reality of Palestinian life, in calling upon him to help end such policies by the Israeli government. In preparation for the Pope’s visit, a group of Palestinian volunteers from the Holy Land Christian Ecumenical Foundation (HCEF) made a cross using recycled concrete from the wall to give it as a gift to Pope Francis. 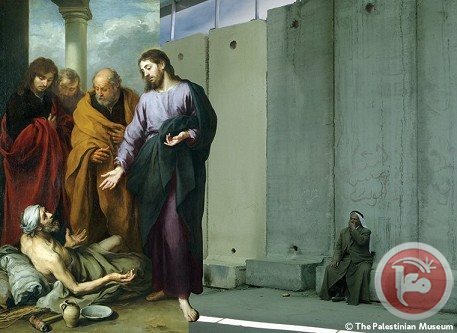 Antony Habash, the Local Director of HCEF, told PNN that this is to remind the Pope about the suffering of the Bethlehem residents, the city he will visit in just a few days. He added that this gift will be given to President Abbas so he gives it to the Pope on behalf of the Bethlehem residents.